NAHA - About 110,000 people held a rally in Okinawa on Saturday to demand that the education ministry retract an instruction pressuring publishers of history textbooks to remove references to the military’s involvement in forcing civilians to commit mass suicide during the 1945 Battle of Okinawa. 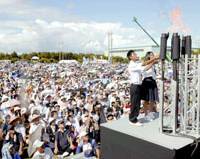 The rally was the largest in Okinawa since the island was returned to Japan by the United States in 1972, organizers said. 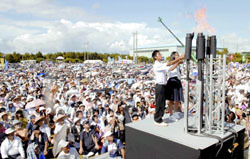 The gathering in Ginowan, just northeast of the capital of Naha, was organized by a committee made up of members from all the blocs in the Okinawa Prefectural Assembly, including Prime Minister Yasuo Fukuda’s Liberal Democratic Party and local governments, teachers’ unions and citizens’ groups. The protesters adopted a resolution urging the central government to rescind the instruction, which requires publishers to rewrite or delete descriptions suggesting the Japanese military induced local civilians into committing mass suicide in Okinawa. Five publishers have already complied with the education ministry’s instruction. “It is an undeniable fact that the ‘mass suicides’ would not have occurred without the involvement of the Japanese military and any deletion of or revision to (the descriptions) is a denial and distortion of the many testimonies by those people who survived the incidents,” the resolution said. “The ministry’s attitude is extremely regrettable. As a representative of the people of Okinawa, I strongly protest to the ministry,” he added. Toshinobu Nakazato, chairman of the prefectural assembly and the director general of the rally committee, said it is an undeniable truth that mass suicides resulted from military orders, enforcement and inducement. “It is our duty to hand this down as a historical fact to generations to come and to make sure that such a brutal war never occurs again,” he said. The committee is expected to organize a large delegation in mid-October to visit the education ministry to demand that it retract the instruction. In March, the ministry told publishers of high school history textbooks to rewrite the phrases suggesting the embattled Imperial Japanese Army forced or told civilians to kill themselves with hand grenades they distributed during the battle in the closing days of World War II. The instruction has angered many in Okinawa, including survivors of the battle, leading all the local assemblies in the prefecture and assemblies elsewhere in the nation to adopt a resolution protesting the ministry’s order and demanding it be retracted. But the ministry has rejected the request and instead supported the decision of the seldom-named experts on the ministry’s textbook screening panel. The new versions of the textbooks subject to the order are to be used in the 2008 academic year, which starts next April. Many of the survivors say the Imperial Japanese Army induced locals to commit suicide to prevent intelligence leaks, but some former military personnel deny the claim. Okinawa was the only inhabited part of Japan where ground fighting took place during the war.